I’ve always had a soft spot for the big Audi sedans, the A8 and especially the S8. Sure, in the styling department they have faltered from their original taut; understated designs have turned abhorrently generic, but they will still haul you from here to there with amazing speed, grip, and comfort. 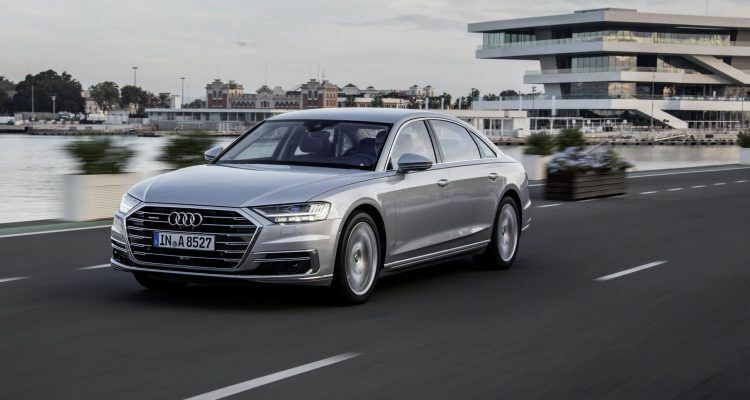 Now, the 2019 Audi A8 looks to up the game even more. 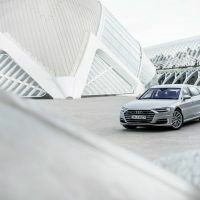 Audi says their new for 2019 A8 delivers a “modern, serene interior design, usable technology, seamless connectivity and cutting-edge driver assistance features” and who am I to doubt them. Indeed, as a top-of-the-line luxo-barge, you’d expect a big German sedan, any big German sedan to be dripping with tech. And just as expected, the A8 does not under deliver. The most important parts, the powertrain and chassis, get only a scant mention. 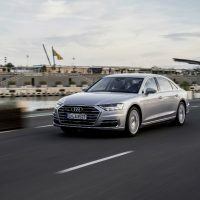 But what we do know is how the 2019 Audi A8 will launch with its new 3.0-liter V6 TFSI turbo engine, paired with a new 48-volt electric mild-hybrid drivetrain. Audi says the V6 makes 335 horsepower and 369 lb-ft. of torque. Gearing is taken care of by an eight-speed tiptronic transmission. Naturally this is mated to a standard quattro all-wheel drive layout with a self-locking center differential. Other chassis and suspension features include adaptive air suspension, available predictive active suspension, and the available dynamic all-wheel steering system. 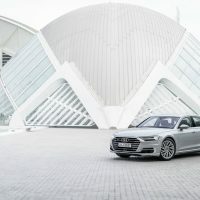 Comprised of 29 different frame materials and 14 cold and hot joining techniques, Audi says the A8 delivers an “intelligent material matrix” for better handling, comfort, and safety. Photo: Audi of America, Inc. The interior of the 2019 Audi A8 is, of course, like a German-built UFO. The standard features include heated, 18-way power front seats with lumbar adjustments and memory, power tilt and telescopic steering column with memory, Velveeta and Nacho leather interior, er, sorry, that’s a Valetta Leather interior with Fine Nappa Extended Leather (whatever that is). The optional air quality package includes an ionizer and aromatization; there is an optional “rear right passenger relaxation seat with heated massaging footrest,” plus aluminum-optic control buttons, and adjustable rear Matrix LED reading lights. Wait, there’s more . . . the smartphone-sized OLED touch remote can be used to customize rear seating and infotainment preferences including the Matrix reading lamps. The front seats are now 22-way adjustable (with massage and ventilation). The steering wheel is heated, the windows are dual-pane acoustic glass, the front and rear door and center armrests are heated, while folding “productivity tables” are located in the center console. 2019 Audi A8 interior layout. Photo: Audi of America, Inc. The new myAudi app enables a greater range of smartphone-controlled vehicle selections. Also standard is the second generation Audi virtual cockpit with a large, 12.3-inch display. There’s an available full-color heads-up display and the Audi smartphone interface works with Apple CarPlay and Android Auto. The Available Bang & Olufsen Sound System comes with a Grateful Dead-level 23 speakers with Acoustic Lens Technology, 24-channel BeoCore amplifier, and a huge 1,920 watts worth of 5.1 Surround Sound. Righteous! The suite of driver assistance stuff reads like something from Mr. Spock’s office: The world’s first laser scanner in a production vehicle, improved sensors, and the zFAS central driver assistance computer that processes all of the sensor information. There is also Adaptive Cruise Assist, Intersection Assist, and Audi Pre Sense 360. 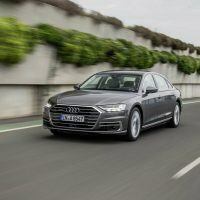 More than just assisting you, if you do, ahem, get into an accident with your new Audi A8, the on-board emergency gizmos are there to help you out. Emergency assist detects if you are unresponsive and brings the car to a stop in its lane, engages emergency hazard lights, and places an emergency SOS call. 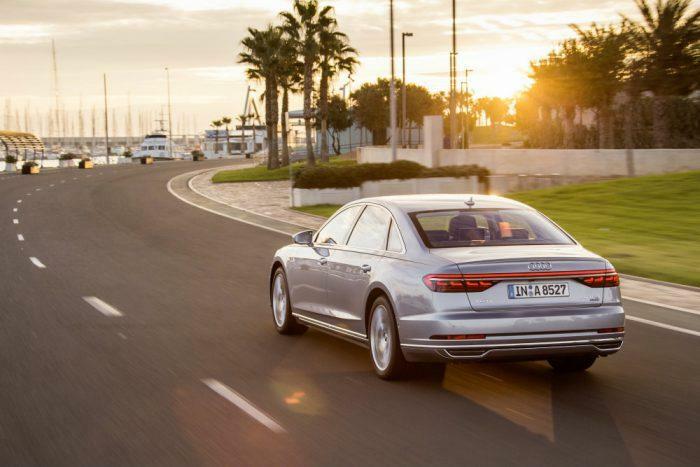 The 2019 Audi A8 with the 3.0-liter engine will go on sale this fall with a starting price of $83,800. According to Audi, a V8 engine will be available next summer. 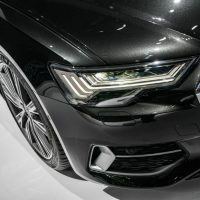 I can only surmise that, given the scant mentions of the drivetrain, it can only (hopefully) mean the upcoming S8 will be a real luxo-Bahn-burner of the first order. 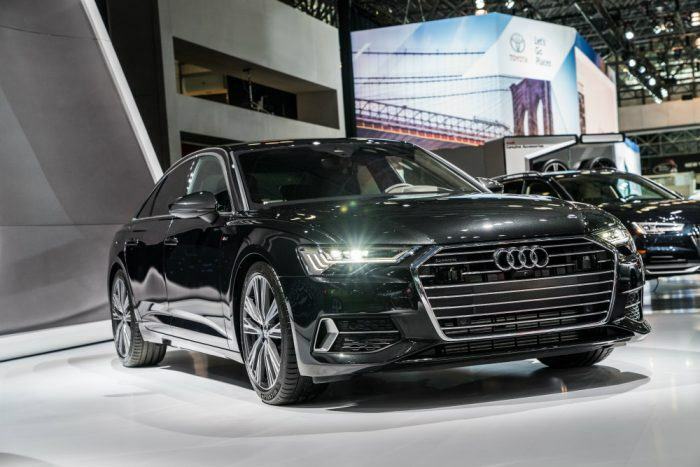 Photos & Source: Audi of America, Inc.
1 Comment on "2019 Audi A8: A Bahn-Burner of The First Order"
The real trick with the A8 is the adaptive suspension, which is that good it should make Rolls-Royce worried.